We Are Sew Happy! : The Mission Maxi Color Block Dress is Finished! The Mission Maxi Color Block Dress is Finished! I just got home from teaching a sewing class, but I couldn't wait to show you a picture of my finished third pattern, the Mission Maxi. With only 2 large pattern pieces (front and back) and 3 small bias strips for neckline and armhole facing, this Jamie Christina Pattern is absolutely perfect as a first time knit project. The pattern includes tips on working with knits, and it directs you to construct the dress in clever ways that make sewing this dress simpler than other patterns would. I have sewn many necklines in knits similar to this but it has never been this easy. Sizing for this dress is more accurate in the early stages of construction because once you cut out the first piece of fabric (the front piece), you can hold the pattern piece against yourself and get a really good idea if you need to go smaller. The size I chose fit perfectly, however, so no revisions were needed except that I shortened the straps so the neckline wouldn't be as low on my chest. The pattern has a halter top version and instructions on how this pattern can be used to make tank tops instead of the dress! This was the first project I have used with color blocking, and I must admit that I was very nervous when cutting out the fabric yesterday. I first cut out the front piece of the dress on muslin and then started drawing lines on the muslin front piece to decide how I would place the different colors. This is where things became difficult. There are so many options for color blocking that I became paralyzed over making a decision. I drew so many different lines on the muslin that I couldn't make sense of any of it. Thank goodness I was using one of our favorite highlighter pens (that can be removed with a hot iron) to mark the fabric because I kept changing my mind and starting over. My amazingly supportive husband (who can even be found cutting fabric in our store when necessary) helped me decide on the alternating triangle shape, and he came to the rescue by helping me measure multiple points on each triangle so each color blocked piece would be the same. He is talented at woodworking and is quite good at measuring so he really gave me the confidence to finally cut up the front pattern piece with our new design. I then had to make sure the back pattern piece was cut the same way because I wanted my color blocking to extend around to the back. It wasn't very hard to line up the side seams perfectly because we did such a good job taking our time getting each piece measured correctly. If you aren't good at measuring and cutting, I would recommend using a simpler linear blocking pattern unless you have help like I did. There are so many ways to get creative with your color blocking that you are guaranteed a unique design! If you have never sewn on knits, I wouldn't recommend color blocking until you have sewn a few basic dresses. Whether you decide to color block or not, you should definitely give this Jamie Christina Mission Maxi pattern a try. I am Sew Happy with it! If you still aren't convinced you can sew on knits, you could also watch for the upcoming class in July that I will be teaching called "Introduction to Knits". I want every sewer to have the opportunity to make a fun dress like this! I was searching for Mission Maxi pics and stumbled upon your post. Your dress is incredible! I love the shapes you've created. 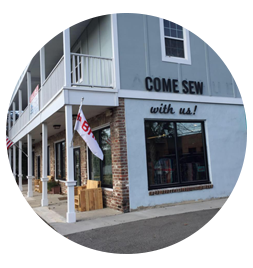 I am "sew" enjoying your blog. Keep up the good work.